I have a special treat for you today and it's one of Niveola's glow in the dark masks! 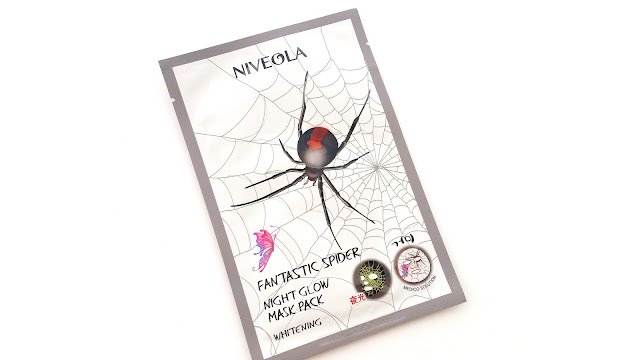 This is the Niveola Fantastic Spider Night Glow Mask Pack. I say this is a treat because it's the perfect mask for Halloween. Not only is the pattern Halloween-esque, but it also has a special feature and that is its glow in the dark effect. Yes, you read right. This sheet mask glows in the dark! Curious to see how it works? Let's get to it! Product Description: The Niveola Fantastic Spider Night Glow Mask Pack is perfect for Halloween! With its costume-like designs and glow in the dark effects, it's really a treat for Halloween. 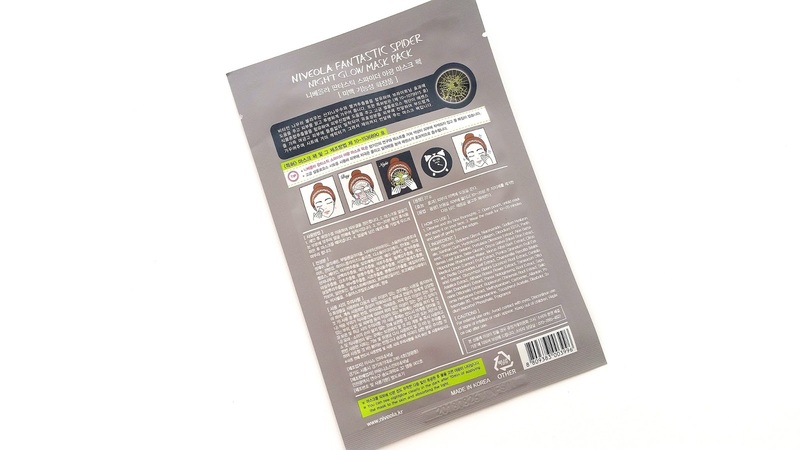 This mask contains rice extract and other vitamin rich herbal extracts to help brighten and nourish the skin. To Use: Cleanse and tone the skin first. Apply the mask onto the face and leave it on for 10 to 20 minutes. Remove after and continue with the rest of your skincare routine. *Glow in the dark effect*: The mask's glow in the dark effect can be clearly seen 10 minutes after mask application. As the mask needs time to absorb light. Packaging: The packaging of this mask gives you an idea as to what the mask will look like with and without the glow in the dark effect. It has ingredients and instructions in English on the back, as well as a tiny bit about how the glow in the dark effect works. However, the rest of the information is in Korean. Scent: Ugh, I was not happy about the scent. The mask had a strong chemical scent with hints of floral soapy scents. Fragrance has been added to the mask. I assume it was added to hide the chemical scent, but it didn't work. I'm not a fan of the scent at all. Color: The pattern on this mask is amazingly beautiful. You'll see it in my mask selfie below. The spider and butterfly combo is great and I really like it a lot. The glow in the dark pattern looks really neat too. 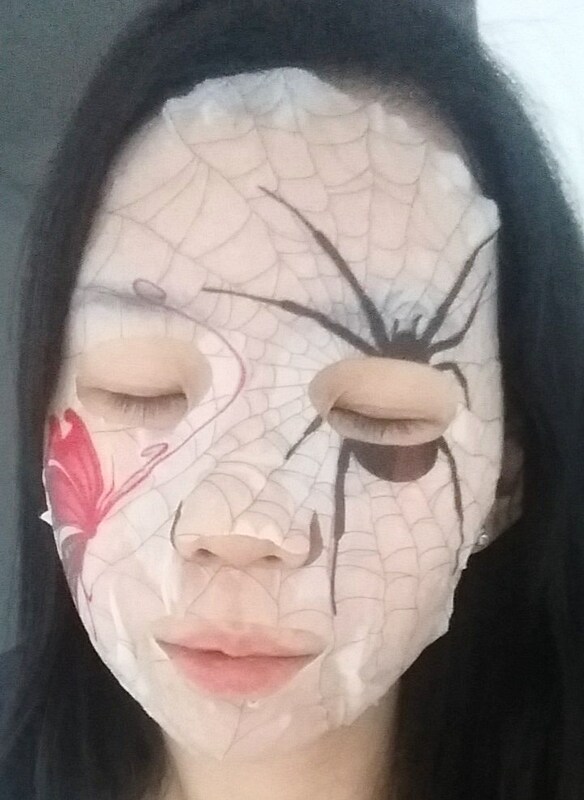 Although, it looks a bit creepy too when it's on your face but it's perfect for Halloween! Texture: The most noteable texture of this mask is its pattern. I can kind of feel it as I run my fingers over it. The texture of the sheet itself feels similar to Etude House's I Need You masks. Michelle's Thoughts: I was nervous about this mask before I applied it. I worried about 2 things. The first was that it might irritate my skin, since they must use some sort of substance to make the glow in the dark effect. I had tested the mask serum before applying the mask and the serum didn't cause any issues. So I wasn't worried about that. 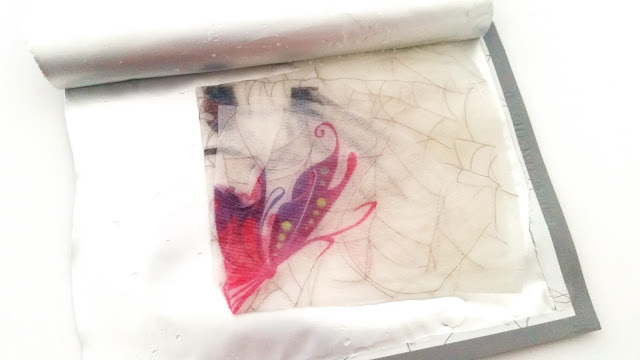 I was more so worried about the mask sheet itself, as that's probably where the glow in the dark material is. The second thing I worried about was the glow in the dark effect. What if it doesn't glow? I imagined I would be quite disappointed if that happened. Fortunately, the mask glowed. 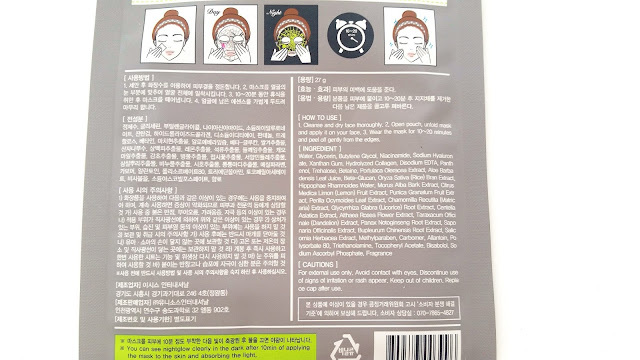 Before I get to the mask's glow in the dark effect, let's talk about its skincare effects. I was quite disappointed with what this mask had to offer. It promises to brighten and nourish the skin, however, there's wasn't much brightening effects to be seen. The mask was fairly moisturizing for its duration and the moisturizing effect did last for a bit afterwards, but it wasn't much. To add to the disappointment, the mask had this strong and unpleasant scent. It's pretty chemical like and I was not a fan of it at all. The scent does start to dissipate after 5 to 10 minutes after application. However, if you are sensitive to scents, you probably won't like it. The material/pattern of this mask was interesting as well. Maybe it's because the pattern outlines the glow in the dark areas, but you can actually feel the pattern with your fingers. It made the mask a bit stiff and add in the mask's awkward cut, you get a mask that might not fit well. For me, the mask's fit was meh. It's not super noticeable in the mask selfie below, but the area around the nose had a really bad fit. It won't stay unless I make some cuts and I didn't want to make cuts this time because I wanted to see the glow in the dark pattern. I just left it but basically, the area around my nose had hardly any mask sheet sticking to it. Okay, now onto its glow in the dark effect. It's good to note that this mask has 2 sides and you want you make sure you wear the right side. The side that faces outwards is the side that absorbs the light. To differentiate the 2 all you have to do is look for the side where the pattern is darker and more noticeable (with both touch and sight), that is the side that faces out. Once you have applied the mask you'll want to find a light source and stay in it for at least 10 minutes. I used the mask at night, so my only light sources were the lights in my house. It worked really well for me. For reference, I used my lamp. I place it right in front of me with the light source facing my face, closed my eyes and danced to 3 and a half songs while I waited for the mask to absorb light (lol). I'm sure you don't have to do exactly as I did, but I wanted to make sure my mask was absorbing light to the max. Haha, >.<" . Anyways, after the 10 minutes I went into my bathroom, closed the door, shut off the lights and watched the magic happen right before my eyes. The mask glowed. It seemed pretty faint at first, however, the closer I moved my face toward my mirror, the more noticeable the glow in the dark effects became. Which just meant that the effect can only be seen within a short distance. Anyways, I was super excited that it glowed and it looked super creepy too. I imagine this would be a great mask to scare someone with, lol. They'll never see you coming. Oh and despite my worries, the mask didn't irritate my skin which is great. It glows! I had to use my professional camera to take this as my phone (my go to picture taking device) just wasn't capturing the glow in the dark effect. Final Thoughts: This is a fun mask to have for the Halloween season. It's a real treat and makes for a nice gift too. However, I probably wouldn't get it for its skincare effects. Its glow in the dark effect works amazingly well and I was so happy when I saw it glow. My only wish is that its skincare effects would be as amazing. 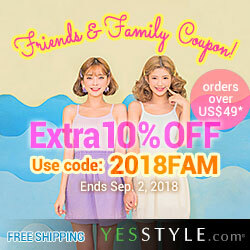 Would I purchase it in the future? While the mask is fun and all, I don't think I'll get it again for myself. (I do have 4 other glow in the dark masks from Niveola to try as well, so I think that'll be enough for me.) I might buy it as a gift for someone else because it is an entertaining mask. Do I think this is worth a try? Well, I do think it's worth it to try a glow in the dark mask once because it's really neat. However, as always, do check the ingredient list before buying to make sure you aren't sensitive to anything.